Students interested in geographic information science at Saint Mary’s don’t need a global positioning system to direct them to valuable, hands-on experiences in their field. 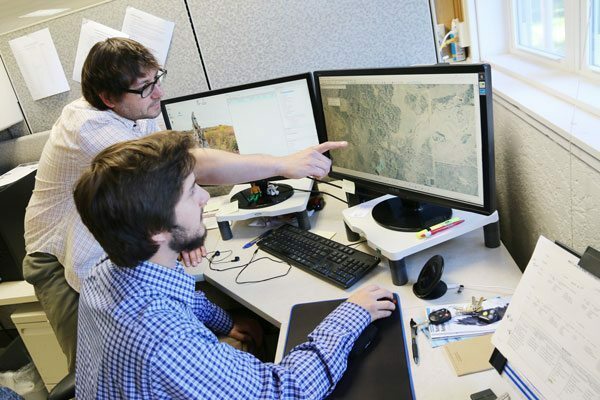 For years, the university’s GeoSpatial Services has been providing professionally mentored field experiences to students. The organization—which provides natural resource assessment, geographic analysis, and high-tech digital mapping services—works with both the public and private sector across a broad assortment of markets and disciplines across the U.S.
For example, pre-med major Christine Neumann is one of 15 undergraduate and graduate students currently classifying Minnesota wetlands in the state’s Northwest region on an $880,000 project for the Minnesota Department of Natural Resources. The two-year wetland inventory project, which began in October, is the largest single project awarded to GeoSpatial Services (GSS) thus far. Although Neumann plans to become a family practitioner, the sophomore from Cloquet, Minn., has been interested in geographic information science since a high school science fair project first piqued her interest. “I did a project on Great Lakes invasive species using Esri’s GIS distribution mapping software—which Saint Mary’s is also using,” she said. Neumann added that the wetlands inventory project will give her good overall skills that will be valuable in her profession. Saint Mary’s University of Minnesota has long been a leader in providing students with the educational foundation and practical experience necessary for successful careers and leadership positions in geographic information science, offering a master’s degree, graduate certificate, and undergraduate minor in the growing and in-demand field. Under professional supervision, and working at the university’s Prairie Island Field Station in Winona, Saint Mary’s students in these programs—and others—will review digital aerial photos and LiDAR aerial laser measurements, interpret features on the ground, and delineate and classify current wetlands. The data will be used to update the Northwest Minnesota National Wetlands Inventory (NWI). Reed Fry is in his first semester of the M.S. in Geographic Information Science program. The Des Moines, Iowa native earned a degree in economics in 2014 and worked in the banking field. The paid student interns—selected through a competitive application process—will gain experiential and hands-on learning outside of the classroom and deeper understanding of the NWI and its benefits. They will also benefit from the wetland ecology expertise of Saint Mary’s environmental scientists, and utilize state of the art geographic information system (GIS) technology. Students will be fully trained and supported by GeoSpatial Services staff to meet the accuracy requirements of the federal wetland mapping standards. Part of that training in wetland hydrology, hydric soil characterization, and vegetation identification will take place at Saint Mary’s Cascade Meadow Wetlands and Environmental Science Center in Rochester. With the implementation of the Minnesota Wetland Conservation Act (WCA) in 1991, state and federal agencies have been working toward a no-net-loss initiative in wetland quantity and quality, with the ultimate goal a net gain in wetland resources throughout Minnesota. A large component of this no-net-loss initiative is establishing and updating wetland mapping, also known as the National Wetlands Inventory (NWI). This information can be used by federal, state, and local governments, private industry, and non-profit organizations as baseline data for wetland regulation and management decisions, land use and conservation planning, environmental impact assessments, and natural resource inventories. The existing wetland mapping for Minnesota is roughly 25 to 30 years old, and the Minnesota DNR has taken the lead to coordinate an update throughout the state. Saint Mary’s GeoSpatial Services has previously collaborated with the Minnesota DNR in creating, classifying, and ultimately updating the Minnesota NWI. From 2012 to 2015, Saint Mary’s University of Minnesota completed wetland updates in the Southern Minnesota region. More information on the National Wetlands Inventory for Minnesota is available online. PHOTO CAPTION: David Rokus, GeoSpatial Services project manager for the Northwest Minnesota National Wetlands Inventory, works with graduate student Reed Fry.